In the construction phase, the main contractor performs all the controls and quality inspections themselves, the subcontractors monitor their own quality work and the client is represented by a consultant or surveyor who again makes his own inspections. The problem lies in the fact that no one collects information and data centralized and thus the information cannot can be found and used afterwards between the different parties. The main contractor or the builder cannot improve and develop their business if they do not know about the problems that arose during the construction period, how the organization reacted to these and ultimately how this has affected building times and costs. Large amounts of information disappear that could be used for both improving the efficiency of the building project itself but also for long-term planned maintenance of the finished building. The information losses occur between the various "silos" that consist of planning, construction and maintenance. It is only the highest management that has an overview of all phases, but the information and data produced do not come from the top but from within these silos. There are too few tools in use that can take advantage of data when the project moves from one phase to another. 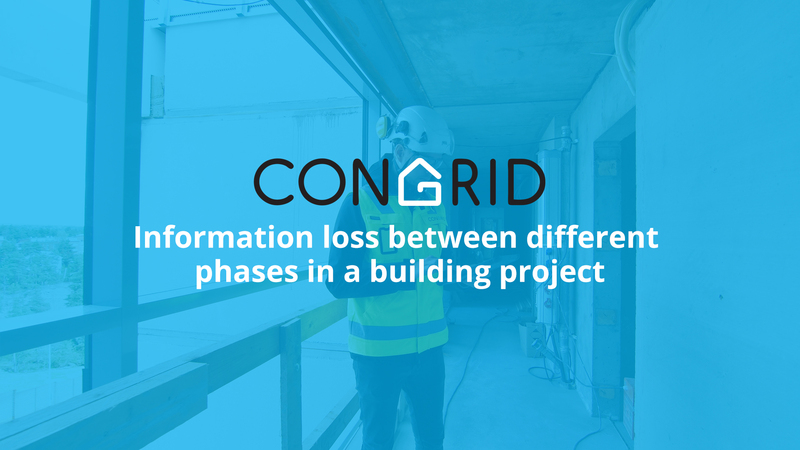 The largest information losses occur in the transition phases between design and construction and then between the construction and maintenance phase. These are the break points where much can be improved in data collection. Congrid collects all data generated from the quality work during the construction project. All parties, regardless of whether it is an entrepreneur, builder or surveyor, can follow the production at the same time. All parties have access to all the data and they can use it in the future and also easily find the relevant information needed. When construction is complete, Congrid can also be used for documentation of maintenance and repairs.